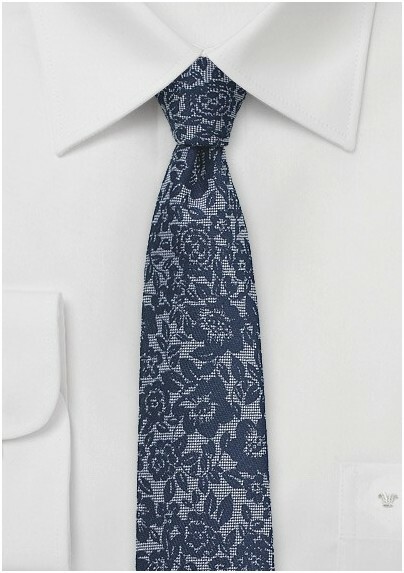 Enchant in this lace silk necktie in blue with floral weave. 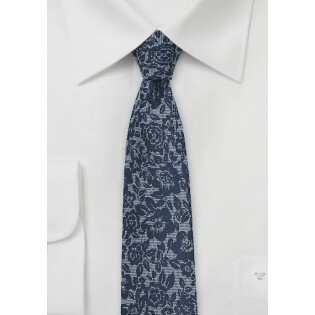 The intricate design of this tie, and dark color tone, provide for a stunning option that will wow at any event. Wear it with a rich red sweater, and blue jeans for a sophisticated ensemble that will captivate any crowd. Handmade by Blackbird from a silk cotton blend, this tie will quickly become your go to tie choice. Handmade 65% Silk, 35% Cotton | Length: 58", Width: 2.75"